From 2012-2014, UCS has more than doubled the number of K-2 students on track to attend college from 20% to 50%. In the fall of 2012, Utica Community Schools decided to transform how students learn starting on their first day of elementary school. Three years later, the district’s bold plan continues to yield exceptional results. In 2011, the administration at Utica Community Schools began evaluating options for integrating technology into their 83 kindergarten classrooms across 25 elementary buildings. In addition to the impending adoption of the Common Core standards, UCS was transitioning to full-day kindergarten and voters had recently approved a bond issue to fund technology improvements. District leaders knew that technology alone wouldn’t transform student learning. To fully leverage their investment, UCS needed teachers to adopt new instructional practices and reimagine their daily routines. With the ultimate goal of empowering teachers to use technology to differentiate instruction, the administration sought an innovative solution to carry out their vision of personalized blended learning. 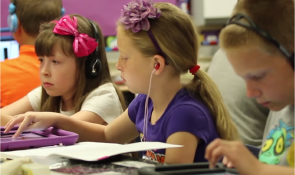 After extensive research and collaboration, UCS designed a blending learning model in which students would progress through personalized learning plans with state-of-the-art technology such as iPads and laptops. Throughout the school day, kindergartners moved through a variety of stations including a laptop center, interactive whiteboard center, teacher-led small group (direct) instruction, peer collaboration without technology, and an iPad center. 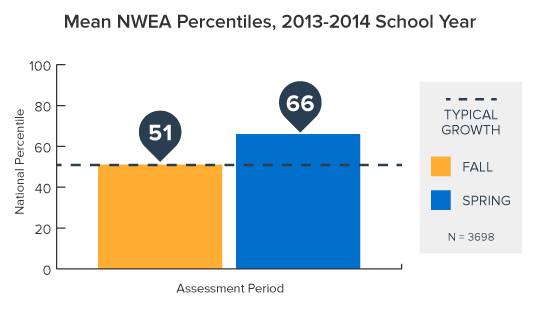 To support their goal of increased differentiation, the district collected NWEA MAP assessment data at the beginning of the 2012-2013 school year to diagnose students’ unique learning needs. Teachers used this benchmark data to set goals and assign individualized learning plans to students using eSpark Learning. UCS incorporated eSpark as a station to personalize tablet instruction and allow students to work at their own pace in their greatest areas of need. While moving through flexible centers, students took turns at the iPad station using their own usernames to sign into eSpark to work on their personalized learning plans each day. In eSpark, students received differentiated iPad apps, videos, and quizzes aligned to their learning goals in reading and math. “eSpark was able to provide our students with personalized learning pathways that truly differentiated for the needs of each learner,” stated Mrs. Catherine Einhaus, Director of Elementary Programs. As an early partner in the development of their blended learning initiative, eSpark designed two days of custom professional development in the summer of 2012 to prepare UCS kindergarten teachers for the launch of eSpark and iPads in the classroom. After the initial PD, teachers received ongoing support and coaching through Professional Learning Communities—collaborative sessions designed for teachers to share best practices for blended learning and using eSpark. After just half a year of implementation, 85% of teachers expressed they were comfortable using blended learning in the classroom. "eSpark was able to provide our students with personalized learning pathways that truly differentiated for the needs of each learner." By the end of the 2012-2013 school year, it was evident that UCS kindergarteners had an exceptional year. In the fall, the students had averaged in the 47th percentile on the NWEA MAP—two to five percentile points below the national average. By Spring 2013, end-of-year MAP data indicated a dramatic shift in performance. After a year of personalized blended learning, UCS kindergarteners were performing at the 63rd percentile on the Spring MAP—ending the year 11-14 percentile points above the national average. In addition to outperforming their national peers, the remarkable percentile growth by UCS kindergartners indicated the students were improving at a faster rate. Students who used eSpark exceeded NWEA growth expectations in both goal and nongoal areas. Growth was significantly higher in the Common Core domains targeted by their personalized eSpark plan. On average, students grew 1.67 times NWEA’s annual expectation in their eSpark goal areas. Because UCS designed its blended learning program to prepare learners for college and career readiness at an early age, the district evaluated their achievement data in a larger context. NWEA estimates that MAP scores at or above the 70th national percentile correspond to a strong probability for college readiness. In the Fall of 2012, 20% of the district’s kindergarteners were performing at or above the 70th percentile nationally. Over the course of one academic year, UCS more than doubled that figure. Spring 2013 MAP scores indicated that 47% of their kindergarteners were performing on a college trajectory. Utica Community Schools developed their blended learning model to allow young students to gain confidence, take responsibility for their learning, and discover a love for their first school experience. However, district leaders did not want the impact of the new instructional model to be lost after kindergarten. Upon seeing the success of blended learning with eSpark in the first year, district leaders decided to expand the program to serve all first graders and incoming kindergarteners for the 2013-2014 year. UCS also extended eSpark into K-6 special education classrooms and four second grade classrooms at West Utica Elementary, where 68 percent of students are eligible for subsidized lunches and 29 percent are English-language learners. By extending the program, the district supported the original cohort of eSpark students in their ongoing academic growth, while providing a transformational learning experience for incoming kindergartners and high-need students. K-2 students using eSpark grew an average of 15 percentile points on the NWEA MAP, further surpassing the national average and outpacing their peers nationwide. As predicted, the participating students demonstrated amazing achievement as a result of personalized blended learning. Between Fall 2013 and Spring 2014, K-2 students using eSpark grew an average of 15 national percentile points on the NWEA MAP. Growth exceeded annual expectations in both goal and nongoal domains. Students grew 12% faster in their eSpark goal domains, demonstrating the rigor and alignment of eSpark’s personalized learning plans. Growth in nongoal domains was higher than the previous year, which may be attributed to higher classroom usage and teachers feeling more comfortable with blended learning practices. 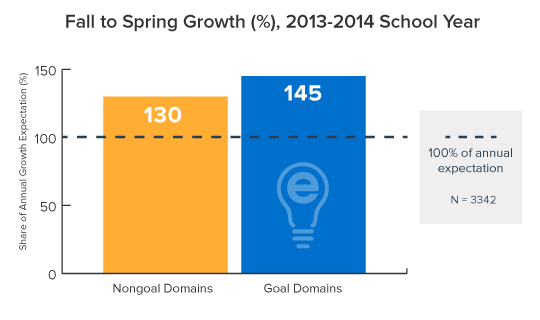 Students grew 12% faster in their eSpark goal domains, and growth in nongoal domains was higher than the previous year. Additionally, UCS continues to prepare students for college. On the Fall MAP, 27% of the students using eSpark scored at or above the 70th percentile. By the end of the year, 50% of these learners were performing at or above NWEA’s indicator for college readiness. "We’re seeing tremendous growth with our students, and most importantly, a love and passion for learning."